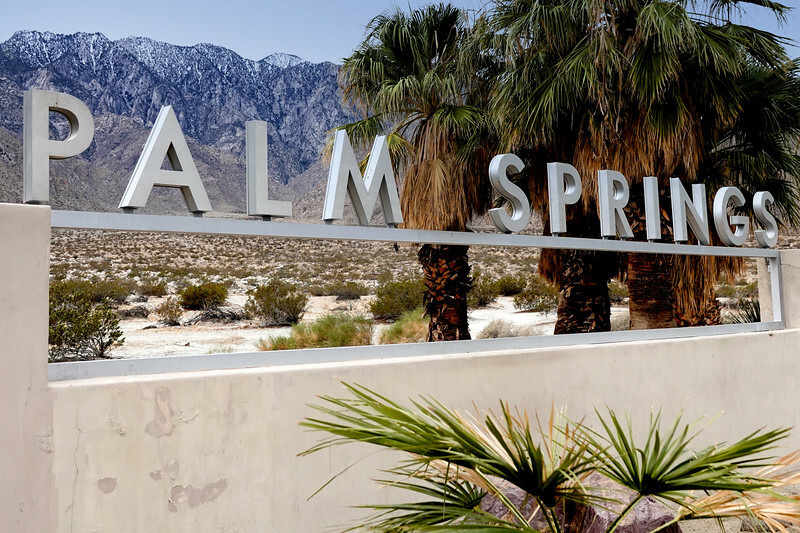 Palm Springs is 90 miles or so from Los Angeles, and a Photowalking dream, especially in the winter, when the mountains are snow capped, the warm temps are more welcome than ever, and the desert flowers are full of life and blooms. We recently took a Palm Springs Photowalk to the desert playground to learn all about the photo highlights of PS. A collection of Palm Springs photo highlights, by Jefferson Graham for the #SoCalPhotowalks series. 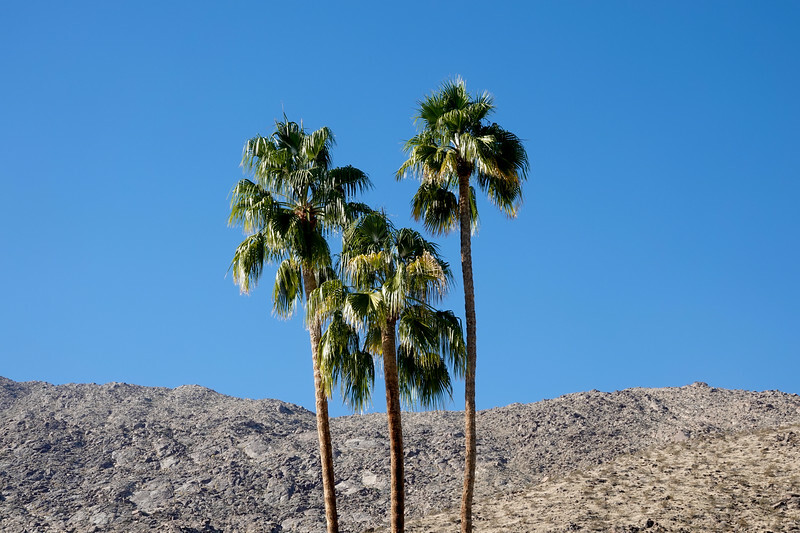 What to photograph in Palm Springs? Every hotel, it seems specializes in big, comfy pools, inviting you to hang around and never leave–at least while the sun is still out. Many have bartenders on call and can be the scene of massive pool parties, or just quiet affairs. 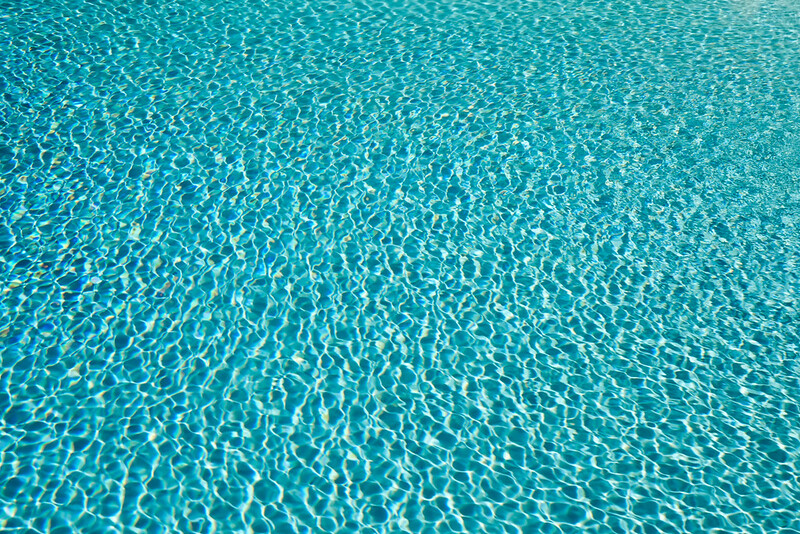 Creating memorable pools in Palm Springs was an artform in the 1950s, where some 900 pools were said to have been built by then. (Just ask the New York Times.) Today, it’s up to 40,000, and that’s within the entire desert area. The Riviera, a classic mid-century hotel favored by Frank Sinatra and his pals back in the 1950s is said to have one of the largest pools, but I’m not buying it. It’s big, but so are the pools at other vintage themed properties. I was more impressed with the Saguaro than the Riv, but that could be just me. 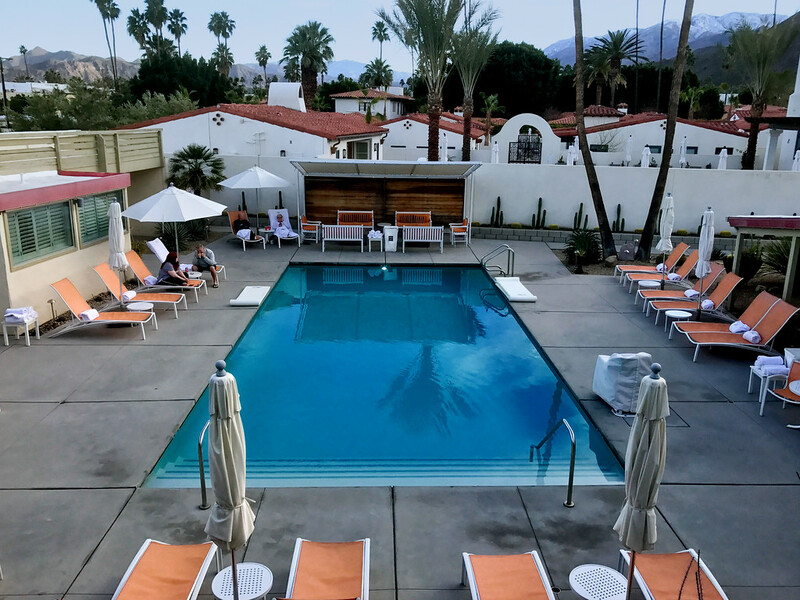 The pool at another classic mid-century property, the Del Marco Hotel, in the Tennis Club district of Palm Springs. 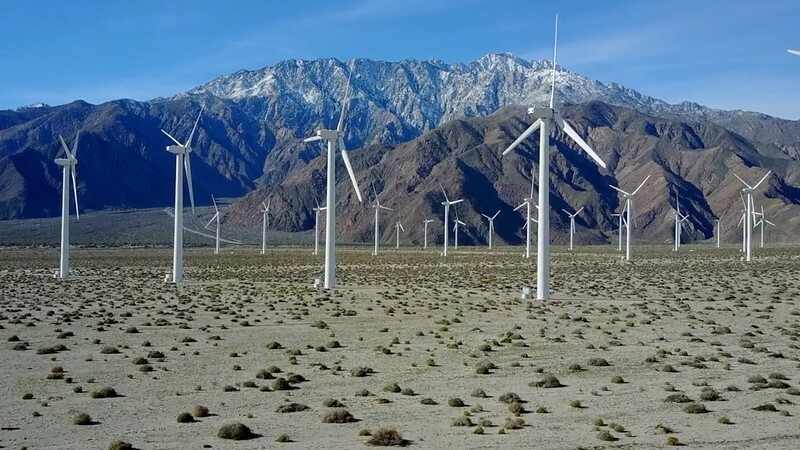 Pull off Route 10 and head down highway 111 down the 10 mile road into Palm Springs, and you’re greeted by a large bank of windmills generating energy for the Coachella Valley. Pull over and get a great shot. 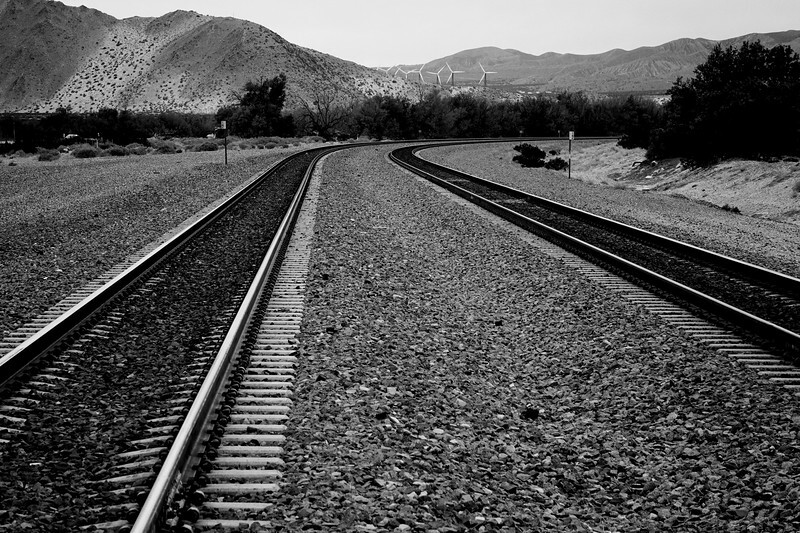 I love this capture of a deserted railroad track, with the windmills in the background. 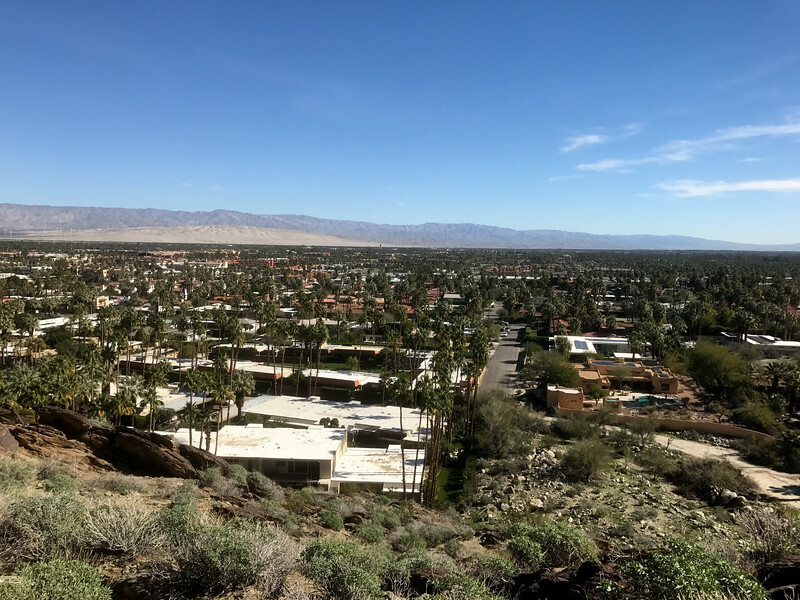 Palm Springs is in love with its mid-century history, when Elvis Presley, Frank Sinatra, Bob Hope and other entertainers had elaborate desert homes. Many are intact, and a joy to look at. Unfortunately on this trip, we didn’t get to do the Movie Star home tour, but we did stay in the historic Tennis Club district downtown, which is ripe with small old motor inns–one of which (Amin Casa) used to be the home for movie siren Gloria Swanson back in the 1930s. 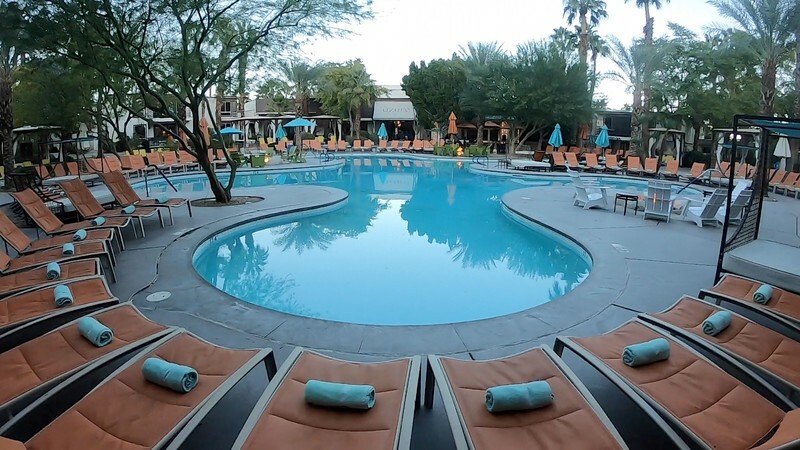 Our hotel (no movie star connection, just a woman named Joanie, the original owner) is a find, if you like hanging by the pool, and being able to walk into town. (Yes!) It’s called Desert Hills, and we can’t recommend it highly enough. 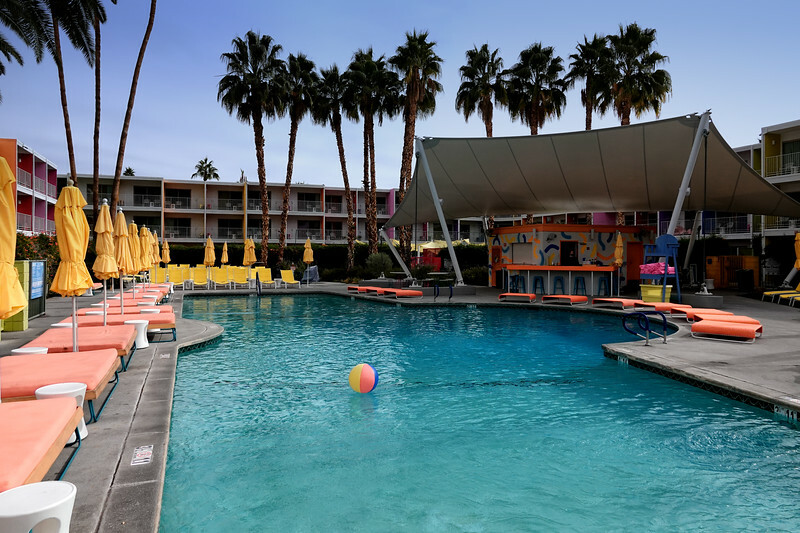 The Desert Hills in Palm Springs is a mid-century, comfy motor inn where all the action revolves around the swimming pool. 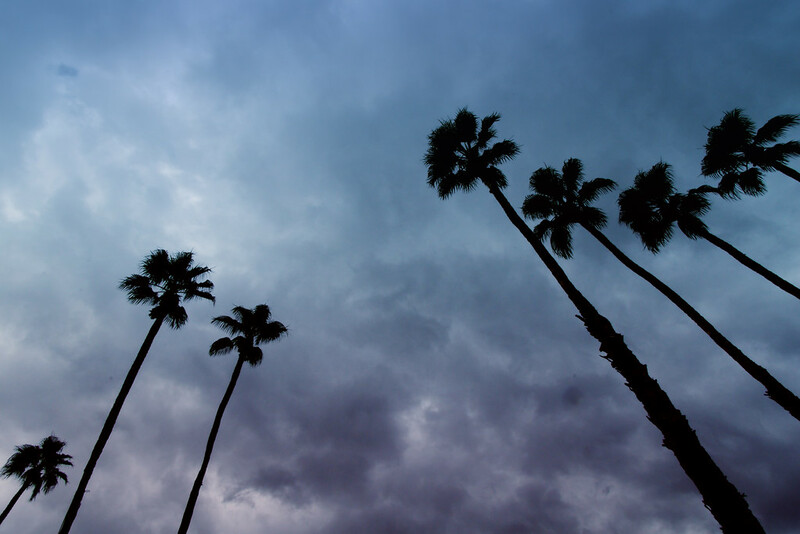 You can’t go too far without seeing the biggest, baddest palm trees you’ve ever had the pleasure of being around. 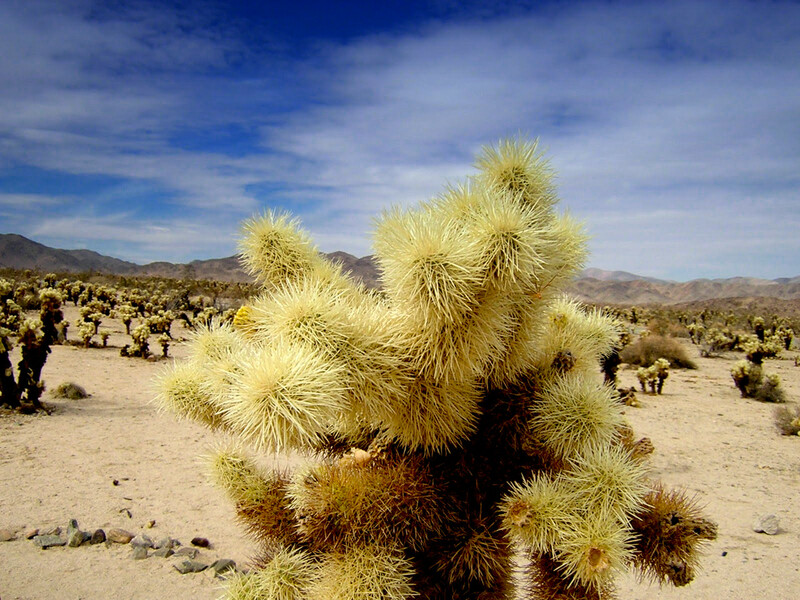 The Joshua Tree National Park is 49 miles from downtown Palm Springs and definitely worth a visit. Why? See below. No P.S. visit is complete without a selfie in front of the “Palm Springs,” sign. This is en route to downtown, at the entrance to the Aerial Tramway, which, for $25 or so, will take you to the top of the mountain for lunch and some snow sighting. 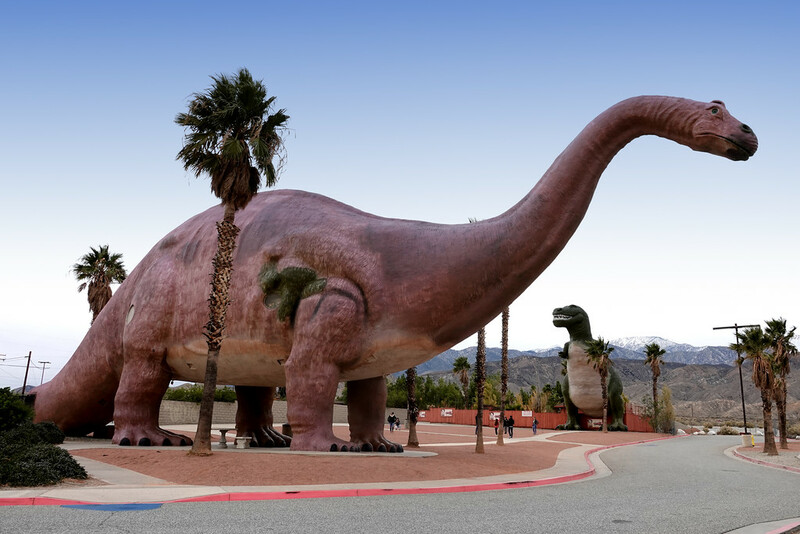 The other really popular stop, for no really good reason, is the roadside Dinosaur exhibit in nearby Cabazon, right on highway #10, where an area Burger King is flanked by two giant size Jurassic Park style replicas. One lets you walk right in and buy souvenirs. 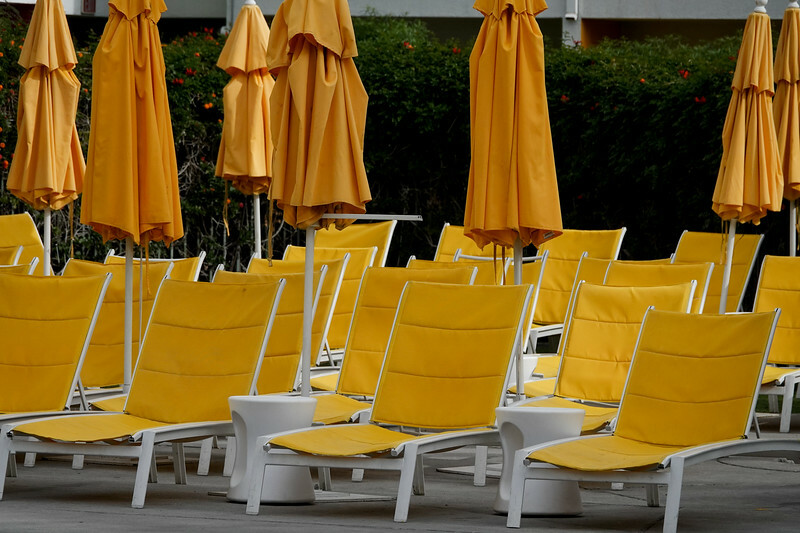 But that’s okay–just a perfect excuse to go back soon, and complete the Palm Springs Photowalk. Riding down Palm Canyon drive, the main thoroughfare in Palm Springs.